Some time ago, many Mac users signed up to participate in the OS X Public Beta program to try out and beta test OS X Yosemite before it was released to the wider public. Since then, being included in that public beta program makes those Macs also receive beta software builds for other updates to OS X as well, including smaller software point release beta builds and beta system software. 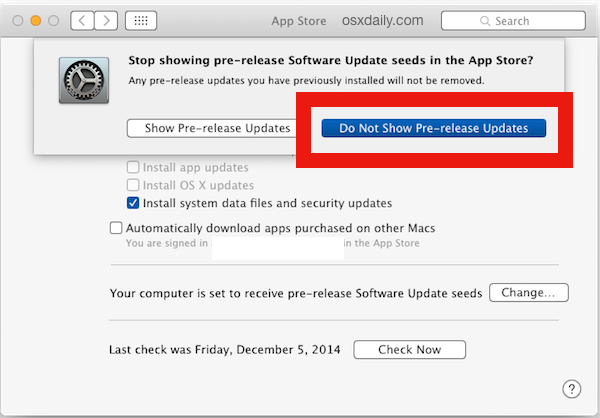 If you’re not interested in seeing and receiving those beta software builds on your Mac any longer, you can opt out of receiving the pre-release software updates. 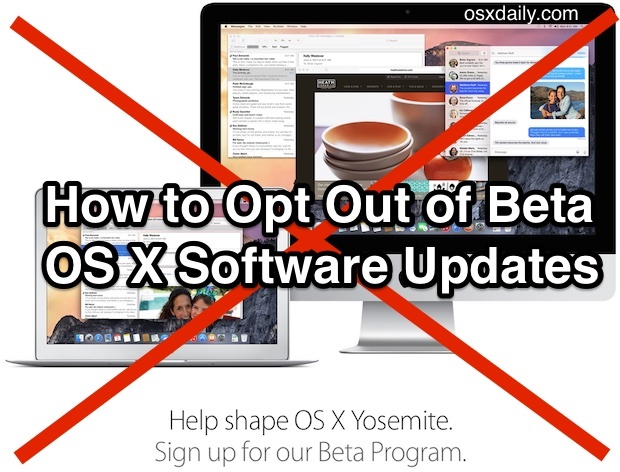 Opting-out of showing beta releases is probably a good idea if the beta updates would be pushed to your primary Mac and you want to maintain stable functionality, since beta software is less stable as it’s an active work in progress. And not to worry, if you decide you want to change this at a later date and opt back into receiving and seeing beta software releases for OS X when Apple releases them, you can easily switch the setting and go right back. Any beta software releases for OS X shown in the App Store will disappear upon relaunching the app and they will no longer be available in the Updates tab. You can also hide specific updates directly but that’s less practical for beta software and beta system releases, since if you’re trying to avoid one you probably want to avoid them all. As mentioned before, you can always change this and show the eligible pre-release beta software for OS X again by simply reversing the above measures and choosing the “Show Pre-release Updates” option within the App Store system preference panel instead. Participating in the public beta and using the beta updates represents one of the better ways users can offer feedback on specific aspects of OS X Yosemite, and that will likely be true for future releases of OS X as well if they offer similar public beta programs. Just remember to not use beta software on your primary Mac where stability is imperative. Remember, this is aside from the general Mac Developer program, and developer releases are separate from the public beta releases described here. Note that some users must turn to the command line to un-enroll from the Mac OS developer beta testing releases. This is accomplished in two parts via Terminal. When successfully executed, the Mac should no longer show any beta software updates. Crap, I forgot about how to change this option, now I’m stuck on yesterday’s beta of 10.10.2 and Spotlight is crashing every two seconds. 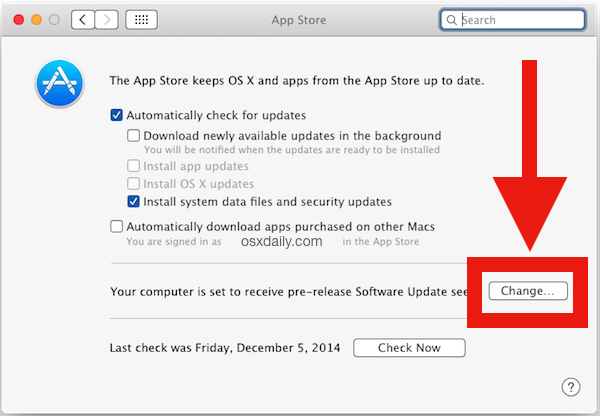 OS X Yosemite will never leave beta, the whole thing, even the so-called ‘public’ releases, perform like beta builds. It’s the worst version of OS X since Lion. Opt out of Yosemite. Totally agree. If Steve was still alive he would never allow what Apple are now releasing. My iPod Nano will no longer recognise on this beta update. As apple doesnt support Beta you have to wait until it is fixed in their next release. I am opting out of Beta Testing as it is rubbish. crap, me too. find any solutions yet? If that’s your case just try disabling it. Good luck! The problem with being a beta tester is that you no longer get support from AppleCare. When I was running 10.10.1 beta, no matter what problem I had tech support would give me grief. I got so fed up with this that I erased my boot drive, reinstalled Yosemite (which involved reinstalling Mountain lion first), then migrating my system from a backup. Annoyingly, 10.10.1 went live less than 12 hours later. Another problem is that the Beta Test Assistant program (the program you use to report problems) takes over the help menu of EVERY application. Any application that has a Report problem entry under help invokes this stupid application requiring it’s deletion from not only the boot drive, but every backup drive you may have despite privacy settings in spotlight. It might be helpful to let people know which version of OS X this works with. I’m using 10.8.5 and this feature is not available. Thanks for the great insight though. I will keep for future reference. The very first sentence of the article tells you what version of OS X this works with. And for some advice if you’re on OS X 10.8.5, you should stay on 10.8.5, the entire 10.10 Yosemite experience is a mess, even the public version is like running a beta. I think OS X 10.11 is going to be the next usable version of the Mac OS. I would have to partly agree…I’m going back to my “wait for the 10.x.3 update before upgrading”. 10.9 Mavericks was the first time I upgraded upon release, only because I read good things about the beta in forums. I thought Yosemite would be similar, but, it’s not. I think 10.10 Yo is having mixed results, but, while it does work faster on my mid 2010 MBP than any Mac OS X since 10.6.8 snow leopard, it’s not without it’s issues. I did the beta program, and, I thought some issues were because I hadn’t done a clean install for several OS X upgrades, so I did a clean install w/Yo, but it didn’t help much. Is it possible to completely remove the option in System Preferences? Having disabled pre-release updates, the button still appears in System Preferences and pre-release updates can be re-enabled. Can the button be completely removed? there is a typo in the terminal command. you left out a dash. The manual instructions were the only way to get me out of the Sierra Developer Beta. Those commands finally did it! Have been looking around trying to figure out how to do this forever! Thank you!